Once again we are beginning the year with harp workshops in Inverness culminating in a concert at the RNI Chapel. There will be two classes at each workshop date, for elementary and more advanced players of allages. Concerts 1 and 3 will be lead once again by local tutors Cheyenne Brown and Isbel Pendlebury. This year we are delighted to invited branch treasurer and tutor Emma Wright and Skye based tutor Eilidh Macleod to lead workshop 2. The cost is £10 to clarsach society members and £15 to non members, payable at the start of each workshop. Please do invite family and friends to the concert. Donations at the door, to Highland Branch. Timing: 1.30-5pm. There will be a short break 3-3.30pm. for us to tune our harps and get ourselves organised into groups. Note there is plenty of parking at the RNI chapel. As a branch we represent the entirety of the Highlands and have been working on how we can better offer events across the region. We are delighted to be able to offer a selection of workshops for elementary, intermediate and advanced players along with a come and try session taking place in Portree High School in Skye this October. Workshops are being taken by Skye based Eilidh MacKenzie and Kirsty Yoxon however we are also excited that the fabulous Freya Thomson is able to join from Dundee. 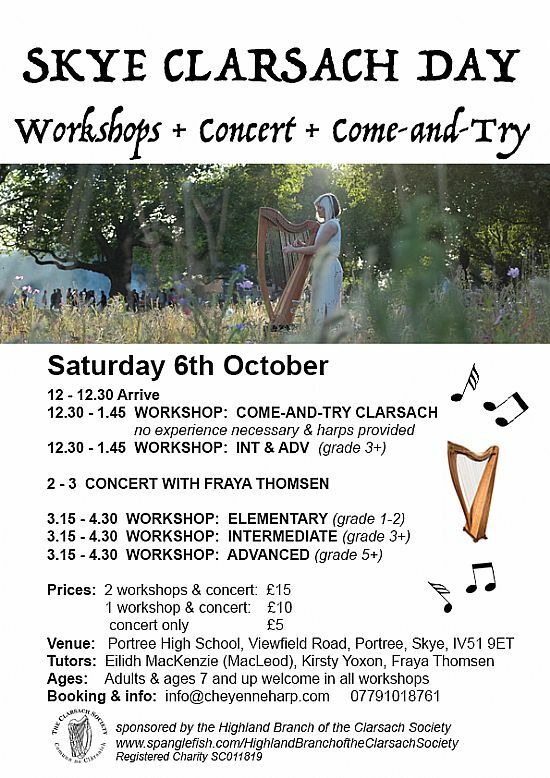 Freya will be performing a solo concert inbetween workshops which is open to all so even if you aren't a harp player do come along for some good music! 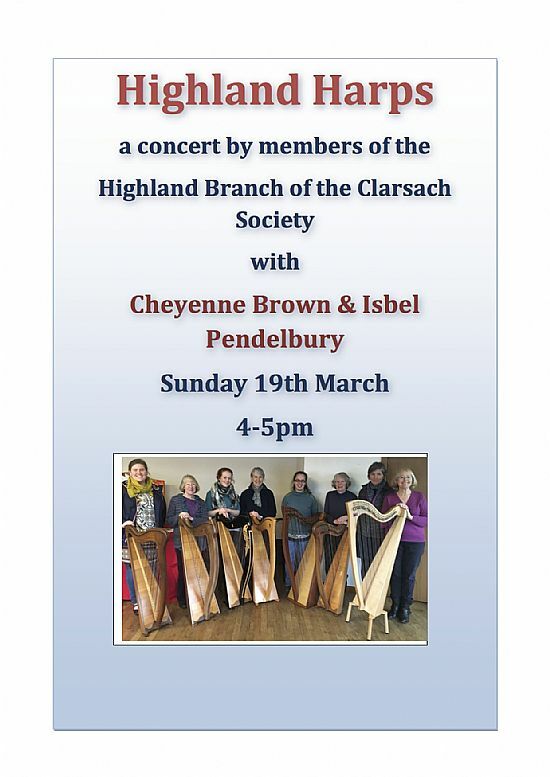 This is a really great opportunity for current clarsach players wanting to learn any new tunes, people who have always wanted to try the instrument or anyone wanting to enjoy a relaxing hour of music from Freya. To book, email or phone Cheyenne Brown at http://info@cheyenneharp.com or 07791018761. We are delighted to offer a second come and try event this September in Dingwall Community Centre. If you have always wanted to try the harp, this free event is the perfect opportunity. No experience is necessary and all ages are welcome. 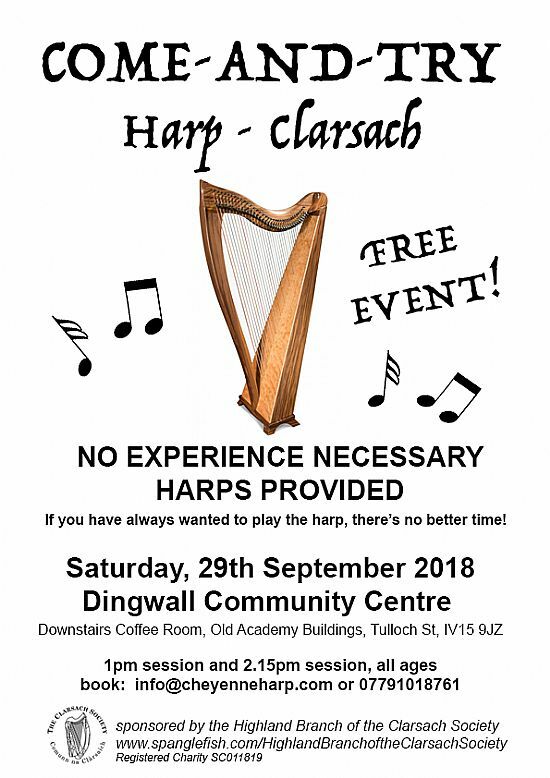 Harps to try will be provided. Saturday 29th September, 1pm and 2.15pm sessions. Dingwall Community Centre (Dingwall Community Centre, Old Academy Buildings, Tulloch Street, Dingwall, IV15 9JZ). First two workshops: Inverness Ice Centre, Bught Park, Inverness IV3 5SR. For the first two workshops the Ice Centre workshop rooms will be available from 1pm for tuning your harp and dividing into two groups (please let Helen know if you need to borrow a harp?). 3pm - 3.30pm: Break (the Ice Centre cafe will be open for drinks and snacks). The workshops will be subsidised by Highland Branch. Cost to Highland Branch members will be £10 per afternoon. Non members will be charged £15 per afternoon. After the final workshop and informal concert will be held at the lovely RNI chapel. This will give the groups a chance to share the music they have learnt along with giving attendees and anyone else opportunity to hear the tutors perform. Should anyone else wish to perform a set they will be more than welcome! Held in Dalabrog in July the Ceolas summer school offers expert tuition in a range of instruments, dancing and gaelic language. The fantastic Ingrid Henderson will be teaching the clarsach throughout this week so make sure you don't miss out! Click on link the links below to find out a bit more about Ingrid and to book yourself a place. Following on from our successful workshops over the last few months we will be holding a small concert in the RNI chapel in Inverness. You will get to hear performances from tutors Cheyenne Brown and Isbel Pendlebury, a few tunes from workshop participants along with some other talented performers. 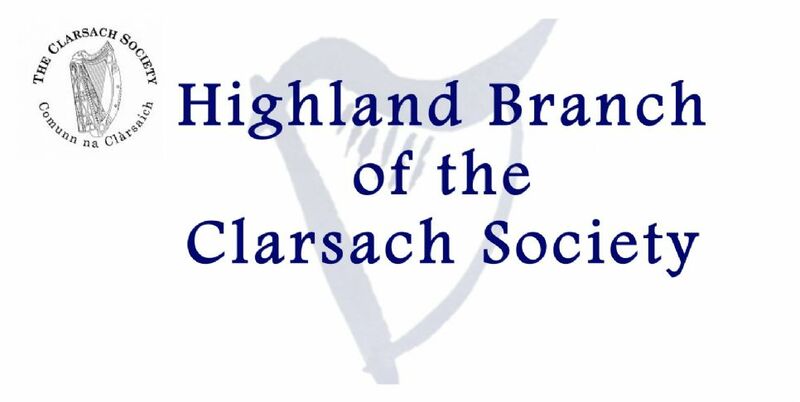 Clarsach Society - Comunn na ClàrsaichTo promote and encourage the playing of the clarsach.